← What do you do with junk mail? I was in Kuala Lumpur, Malaysia last week and it was heart-breaking. I grew up in Malaysia and have family and friends living there. There was what was called ‘haze’. The photograph I took was in the middle of a sunny day. The ‘haze’ seemed to darken the sky. ‘Haze’ sounds a minor inconvenience. A little mosquito bite. Nothing of consequence.It really was smog and the pollution levels (API) were high; bad is about 150, severe is 300. There were reports of 760. When I went out I noted how I could taste the pollution. I could taste the wood and smoke particulates in my mouth. It was as though I was going out for a toxic meal everytime I opened my mouth and breathed it in. Burnt tree with Malaysian air was the speciality. 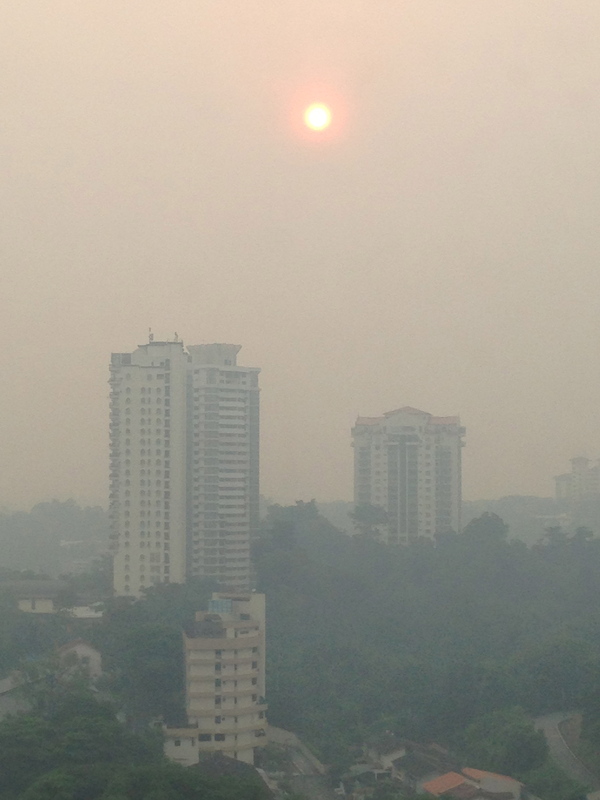 The smog is occurring because there is forest burning in Indonesia. When the Singaporeans complained about the pollution, the Indonesian government retorted that the Singaporeans were being ‘babies’. Lets think on this some more. This slash and burn and clearing which is causing untold damage to the air quality has been going on for over 20 years in the middle months of the year. What does smog do? It is not just about quality of life but smog has oxidants. It has free-radicals which are absorbed into every part of our body. It causes respiratory problems. We do not just have a problem breathing, but also thinking. Our thought processes and cognitive functions are affected. Smog can make you stupid. Free radicals in the air are oxidative stress and an excess of free radicals will enhance aging and in the long term cause degenerative diseases. Think about it. This smog is just not a minor inconvenience but also will add to the list of possible diseases you will get – or anyone who visits will get. For example degenerative diseases which are associated with free radicals are: heart failure, cancer, Alzheimer disease, cognitive impairment, cataracts and macular degeneration. Psychiatric illnesses are also a possibility; autism, dementia, schizophrenia, anxiety, mood, sleeping and eating disorders have been associated with oxidative stress. The smog is not just an inconvenience but also has other far reaching effects governments are unaware of. How can you help ameliorate these free-radicals which are being given away so freely by governments who do not have enough protective policies in place? Face masks with carbon filters are helpful. Antioxidants as a means to counter the deleterious effects – vitamin E, Vitamin C, selenium, beta-carotene, lycopnene and other carotenoids. Go out as little as possible and close your doors and windows – maybe with clingfilm to seal the air out. The best way is to do something about it. legislate. Fine the culprits heavily. Have a body in place that actually monitors this. Otherwise in the long-term these developing countries are really developing and hot housing some pretty horrible diseases for the future. Otherwise migration may be necessary…….to another area where there may not be such awful levels of air pollution….